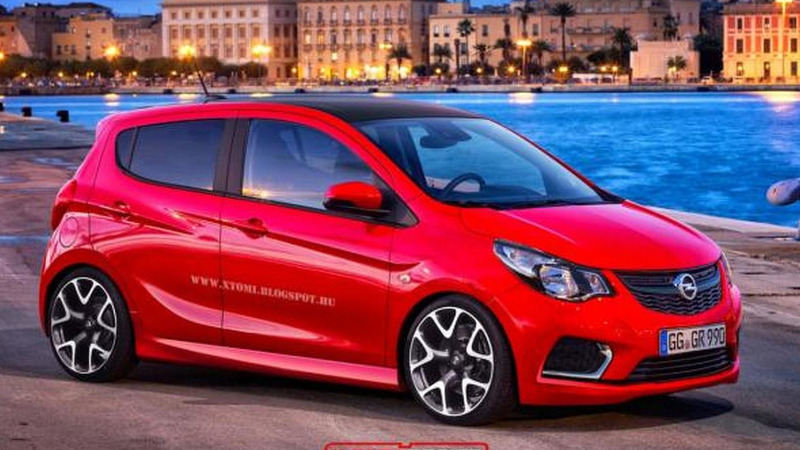 X-Tomi Design has decided to show us his vision of a hypothetical Opel Karl OPC / Vauxhall Viva VXR. It was only yesterday when Opel released images with its new entry-level model and already independent artist X-Tomi Design used his digital knife to apply the OPC treatment on Opel's Agila replacement. With a starting price of less than €10,000, the Karl was developed to be a cheap no-frills city hatchback so chances of seeing a hot version are slim. For those who really want a more potent Opel small car to use around town, the General Motors-owned brand has the €18,690 Adam S which packs a 150 HP (110 kW) punch from a four-cylinder 1.4-liter turbo. As for the Karl (named after one of Adam Opel's sons), it will be offered only with a three-cylinder 1.0-liter turbo outputting 75 HP (55 kW) sent to the front axle through a five-speed manual gearbox. Set to be commercialized exclusively as a five-door, the Opel Karl / Vauxhall Viva duo is programmed to go on sale next summer.